Remove the crank arms according to the manufacturer service manual. 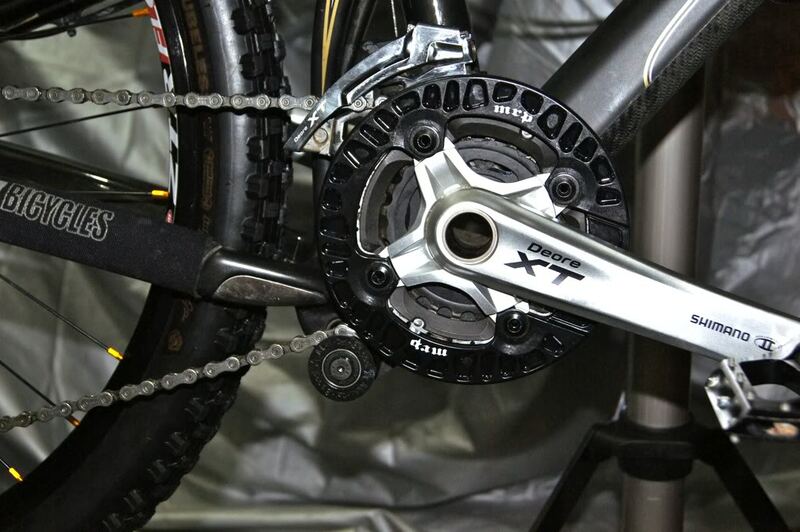 Dissemble the chain rings and install the bashguard to the chain rings as illustrated on below's photo. After cleaning the chain rings, grease the four new bolts that come with the MRP LRP. Firstly, secure the larger chain ring to the bash guard, then install the smaller and larger chain rings on the bash guard. Ensure the washers are fitted on the bolts, resting on the outer and inner part of the bash guard. Otherwise, the bash guard will not be able to securely attached to the chain rings. The are four different mounting standards for the MRP LRP, namely; (1) Direct bottom bracket mount single roller arm attaches to the bottom bracket with pressure from the bottom bracket cup; (2) ISCG single roller arm attaches to three tabs around the bottom bracket shell; (3) ISCG-05 Larger bolt circle diameter than ISCG; and (4) E-Type for use with e-type front derailleurs. Santa Cruz Nomad Carbon uses ISCG-05 type. 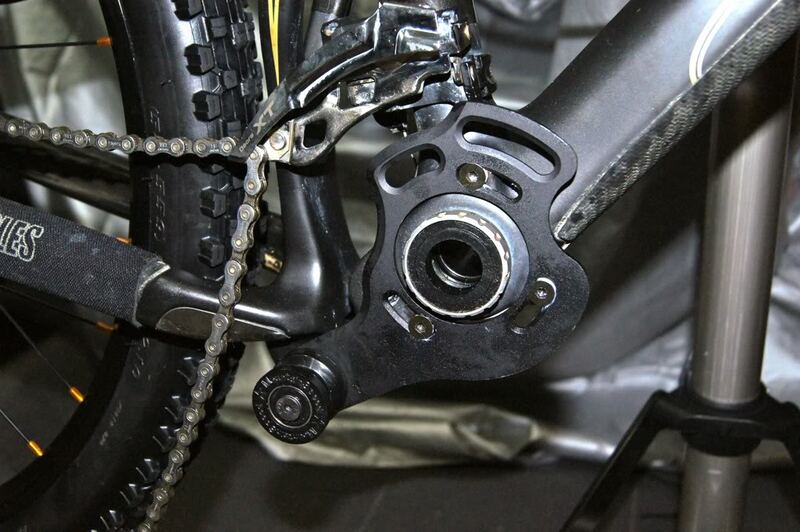 Install the chain tensioner with the allen bolts supplied together with the chain guide. Grease the bolts before installation. 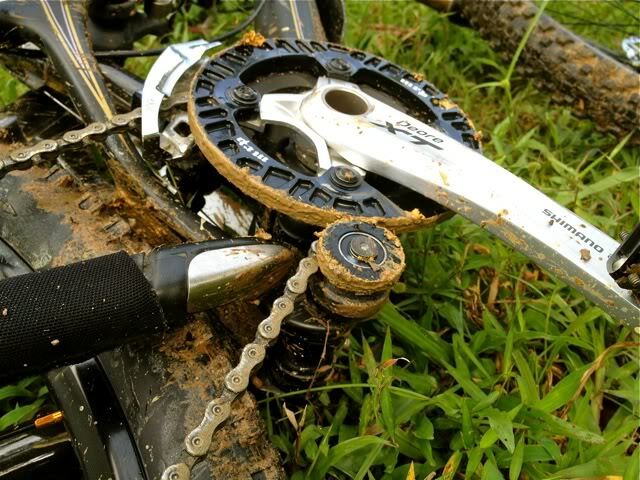 The chain tensioner should be adjusted to prevent the pulley from hitting the bash guard and the bike frame. Ideally, the chain tensioner's roller should be installed as near to the larger chain ring as possible to provide optimum chain tension. If your Front Derailleur has been adjusted correctly before installing the MRP LRP chain guide, you will not require to adjust the Front Derailleur again. If you convert 3 chainring into dual chainring to fit the chain guide, you will need to adjust the high limit screw on your front derailleur so it cannot shift the chain up onto the guide ring. Do not change the height of the derailleur, its ramps are designed to work at a certain height, and if you deviate from that placement, it will not function correctly. The chain position on the roller will follow the chain ring you are currently using. When the chain is at the larger chain ring, the chain will rest on the groove of the pulley. When the chain is at the smaller chain ring, the chain will step up onto the inner part of the pulley, resting against the shoulder. The MRP LRP fits the Nomad Carbon perfectly, without the need to tweak the tension arm to achieve the optimum position. I am not able to speak for other bike frame. Tested the MRP LRP Chain Guide on muddy and rocky trails, did jumps and drops on both trail and urban ridings without a single chain drop. Both the chain guide and bash guard were tightly fitted on the frame, no sign of loose fit after some hard hits. Surprisingly quite and stiff, feel more confident than without it. Some may complain the plasticky feel of the bash guard, but I think is a good balance between weight and toughness. Highly recommended. 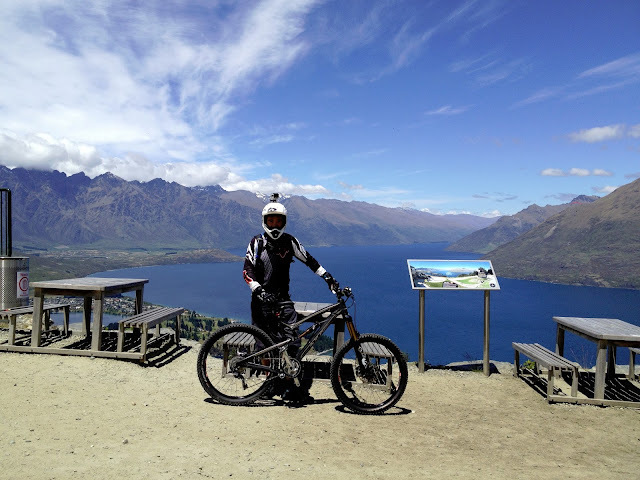 Hi, i have a xt m785 dual crankset. can it fit the mrp lrp bashguar on my dual crankset? 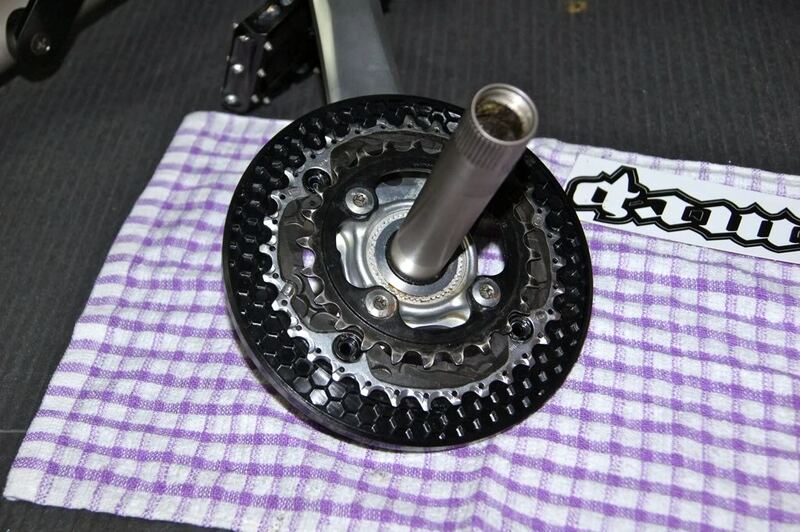 thanks for the fast reply, usually i seen ppl replace their outer ring with a bash as theirs is a triple crankset. urs is inititially a double or triple crankset? I used triple but have since changed to double. I think the bash will fit as long as the outer ring is not bigger than the bash, and the bolt size is correct. The bolts normally supply together with MRP LRP. Hey dude! I got a 2011 alu normad, just bought the MRP LRP. It doesnt seems to fit well, as i got lots of dragging with the rollers and my chain. i wonder if its the front dee setup.. Need to see your rig before I can make an intelligent guess. Are you using long or mid cage? Have you adjusted the position of the chain tensioner to get optimal result? Is you chain too short? Did you over tighten the roller screw? Did the chain rub the front derailleurs?